With 2018 rapidly approaching, we're continuing to see new Synology NAS models with "18" as part of the model number. Recently, I reviewed the 4-bay DS418j. The "j" indicates that it's a member of Synology's Value line. This review will focus on two new 2-bay Synology NASes: the DS218j and the DS218play. The DS418play (not yet reviewed) uses an Intel Celeron J3355. The chart below, generated from the NAS Finder, shows the basic differences between the DS218play and the DS218j. (Click here for the full comparison.) The DS218play features a beefier Realtek quad-core processor and 1GB of RAM. The DS218j is powered by a dual-core Marvell Armada 385 processor and has 512 MB of memory. Both NASes feature two USB 3.0 ports, a single Gigabit Ethernet port and both require case disassembly to install the disks. As noted in the introduction, installation of the disks requires case disassembly to mount your disk drives with screws into the mounting brackets. However, this is not as daunting as it sounds. Synology has streamlined the process, eliminating drive mounting brackets for most 3.5" drives. They also ship the products with the case screws packed separately. So all you need to do is slide open the case, slide in the drives and secure them with screws. If you're using 2.5" drives, you'll need to purchase a Type C mounting bracket for each drive. At around $20 a pop, I'd stick with using 3.5" drives. You can download the 218play and 218j hardware installation guides for more details. The callout chart above shows the front and rear panel layouts for the DS218play; the diagram below shows the DS218j callouts. Both have their two USB 3.0 ports on the rear panel. USB 2.0 ports are becoming a thing of the past, and neither the DS218 play nor the DS218j has them. The single Gigabit Ethernet port indicator is on the front panel and indicates only link/activity/no network. The image below shows the main board for the DS218play. This board has a large heat sink thermally-coupled to an RF can top covering the processor and RAM. The image below shows the main board for the DS218j. Both boards share the same physical dimensions and have similar component layouts. That's not too surprising considering that both the DS218play and the DS218j have identical case sizes of 6.5" X 3.9" X 8.9" (165mm X 100mm X 225.5 mm). Note the play has an audio buzzer, but the j does not. The table below shows the key component summary for the two NASes. The DS218play drew 10 W with two of our stock WD Red 1 TB (WD10EFRX) spun up and 3 W in power save mode with the drives spun down. By comparison, with the same complement of installed drives, the DS218j drew slightly more power (12 W) in both the active mode and in power save mode (4 W). Fan and drive noise was rated very low for both NASes. RAID 1 build time was < 10 minutes for parity check with bad block check skipped for both NASes. As I noted in the recent previous Synology product reviews, all of Synology's NASes operate using DiskStation Manager 6. DSM 6.1 provides a common set of features and a consistent user interface across all of Synology's products. Of course, some higher-end products support enhanced features, such as the BTRFS filesystem that isn't supported on J Series and Value Series products. If you want to take the user interface for a test drive, Synology has an online emulator for the beta version of DSM 6.2. This link will give you a 30-minute session to explore the user interface. Of course, some admin features and well as cloud storage and file synchronization are disabled in the demo. You can also browse through the video tutorials in their Knowledge Base, or download the DSM 6.1.4 User's Guide. The screenshot below shows the DSM 6 control panel along with the performance widget running on the desktop. This was created from the online DSM 6.2 beta. DSM 6.1.4-15217 Update 2 firmware was loaded onto both the DS218play and the DS218j and performance tests were run using the Revision 5 NAS test process. All tests were run using two Western Digital Red 1 TB (WD10EFRX) we installed and configured in RAID 0 and 1 volumes. 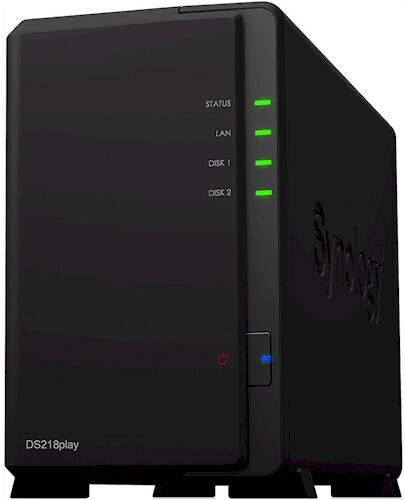 For this review, I am only comparing the Synology DS218play to the DS218j. File copy Write and File Copy Read results were consistent across both RAID levels (RAID 0, 1) for both NASes. All results were above 100 MB/s and approached the theoretical limit of single client testing on a single Gigabit connection. 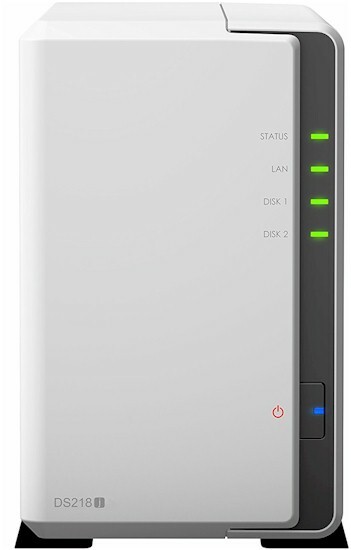 However, the DS218play performed slightly better than the DS218j for all File Copy Read, File Copy Write, NASPT File (and Directory) Copy to NAS and NASPT File (and Directory) Copy from NAS for both RAID levels. In fact, if you compare results line-by-line, you'll only find a couple of RAID 0 tests in which the DS218j turned in slightly better scores than the DS218play. For the USB 3.0 backup tests, the DS218play clearly outperformed the DS218j for all filesystems (FAT, NTFS, and EXT4). For NTFS backup to USB3, the DS218play was more than twice as fast as the DS218j. The DS218play also edged out the DS218j on the network backup tests as well as on both iSCSI Write to Target and iSCSI Read from Target tests. Using the NAS Ranker, I filtered for RAID1 class products, test method 5 and sorted by Total NAS price. The chart below shows the DS218play earned a #1 Performance Rank award, moving the previous #1 ranked ASUSTOR AS3102T down a spot. Even though there are two other #1-rated NASes in the chart, the Total NAS score for the DS218play (2.5) shows that it outperformed our other #1 ranked NASes from previous months. The DS218j ended up with a rank of #8, but it's actually tenth on our charts due to ties for the #5 and #7-ranked products. The ascending price sort shows the DS216j, currently at $150, as a better buy than the DS218j at $170. It doesn't take a lot of analysis when you look at the individual category performance rankings. The DS218play outperformed the DS218j in every category with the exception of the Video category where it tied with the DS218j with a #4 ranking. Currently priced at $230, the #1 ranked DS218play delivers top performance at a good price. Its quad-core processor and real-time 4K HD transcoding capabilities (at 30fps) make it a clear choice whether you're looking for a 2-bay media powerhouse or just a fast NAS for file sharing and backup. There are 18 2-bay RAID 1 products in our charts, with prices ranging from a low of $90 to over $400. If your budget limits you to $200, there are still good choices. Interestingly, the #6 ranked Synology DS216j currently sells for $150, and it has a better ranking and is cheaper than the #8-ranked DS218j. My recent check of Synology's website shows that the DS216j is still an active product - at least for now. For under $200, you might also consider the #4 ranked QNAP TS-231P, which currently sells for $171. It features two Gigabit Ethernet ports, three USB 3.0 ports and the drives are hot-swappable. That's enough to win my vote for the best value sub-$200 2-bay NAS.